For about a year, we have been talking about selling our large village house in Southern France, our home for the last 24 years. This project is now a reality: The house is for sale. If anyone has a dream about owning a big house from the Medieval era, this is your chance! The house used to be a winemaker’s. When we bought it, the old press was still standing in one of the rooms. Other rooms on the ground floor were arranged as stables for sheep and horses. The house is situated in a high spot, about 230 m. above sea level. To the West, one can see woods of pines and chestnut trees. To the East one can see the main buildings of the village: The church and the château, a medieval fortress with towers and embrasures, and walls reaching for the sky. To the South we have a large terrass, where the sun shines for most of the day all year long. For hot days there is also a small shaded yard with a large palm tree and bamboos for coolness. The house itself is comfortable: The thick walls keep it cool in summer and warm during winter. Oil heating helps keeping the house warm in the latter case. It is placed in the center of a tiny village, Fontarèches, and opens up towards the peaceful gravelled Church Square, where century-old acacias strech out their crooked branches towards the house and the square. Church services are rare, but the church, which was built in the Eleventh or Twelfth Century is beautiful and recently restored. All the buildings in the village are made of yellow ocher stones, which glow in the sunlight. Sun is not wanting: This region has the most hours of sun in all of France. In the first Century there was a Roman Villa where the Village is, Villa de Fonte Erecto (“The Villa With the Springing Source”). About the Sixteenth Century the Village was given its actual name: Fontarèches. The source is still springing, but at a calmer pace. 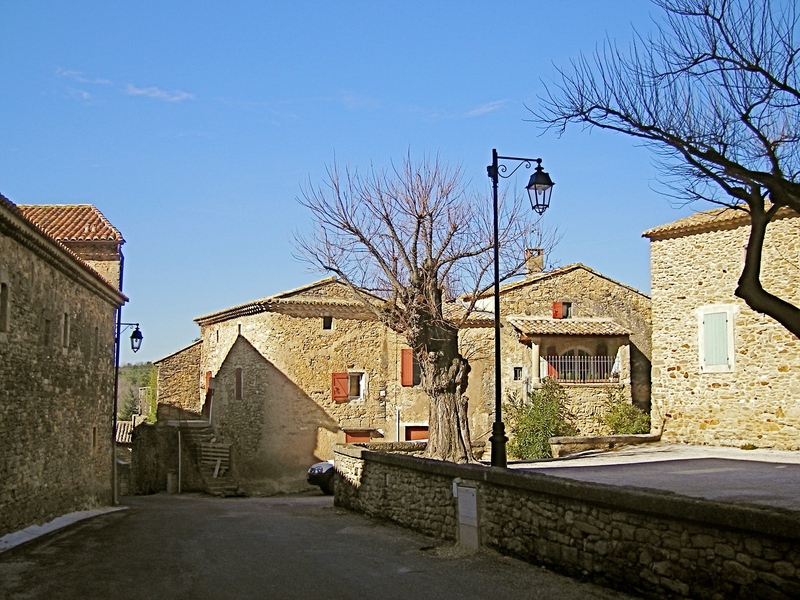 The Village is Built on a rock upon the plateau, and is surrounded by wild nature: Woods and spaces with low bushes called Garrigue. One can walk for hours in this landscape without meeting anyone but rabbits and wild boars. In view of the sale, an evaluation of the house has been done (diagnostic immobilier). It is mandatory in France, when you want to sell a house. The expert said that it is a strong and healthy house, which we have always felt. It has also been given the energy label “C”, which is exceptionally good for such an old house. We believe that we owe this to our Danish sense of comfort and experience with keeping the cold out, which has been with us in every step of the restoration process. We have always been very fond of living here. Now that our decision is taken, we want to enjoy our last time here, and revisit the places we have known and loved through the years. In two weeks the truffle market in Uzès will start. Following our own tradition, we will go to one of the local restaurants for lunch. For the occasion they usually serve a three course meal dedicated to truffles. Maybe we will even buy a truffle of our own to flavour our home cooking. Then Spring will be here: By the end of February the almond trees will be covered in white and pink blossoms. They are followed by the pink apricot blossoms and, almost simultaneously, the peach and the cherry blossoms and finally the apple blossoms. The whole landscape is lit up with clouds of delicate flowers. The Vineyards are freshly cropped and ready to grow their long tentacles. They are waiting for May, when the the nightingales are singing like crazy. Legend has it a nightingale was once caught in a fastly growing vine while it was sleeping, which is why they sing all night to stay awake at that time of year. Many of the vineyards have been planted during the 24 years we have lived here. The agricultural project is to make quality wine: Not far from here are the well known wine districts Gigondas, Lirac, Chateauneuf-du-Pape, and the best Rosé of France, Tavel. The Vinyards we cross during our daily morning walks produce a wine that is comparable to these prestigious brands. We also project to re-visit the cities not far from here: Nîmes, with its big Roman arena, Avignon and the Pope’s palace and Pont du Gard, the impressive Roman building that led water from the source in Uzès to Nîmes, 50 km. away. Another place we plan to see again in a near future are the great ocher pits. Their many nuances and plays of light have inspired me a lot in my painting.